The introduction of PRINCE2 Agile has led to the development of the world’s most complete agile project management solution. 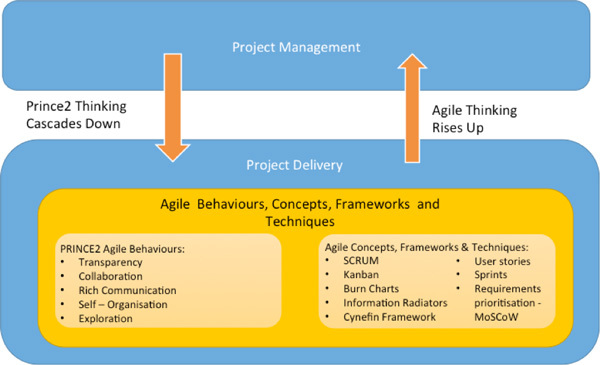 PRINCE2 Agile combines the flexibility of agile behaviours, concepts and techniques with the project management themes, processes and roles as described by PRINCE2®. The PRINCE2 Agile Practitioner course is a 3-day program aimed at developing an understanding on how to apply PRINCE2 in an agile project management environment. This training illustrates how to tailor PRINCE2 by combining agile project management behaviours, concepts, frameworks and techniques. PRINCE2 Agile training is an additional module to the standard PRINCE2 Foundation or PRINCE2 Practitioner training. The PRINCE2 Agile training provides detail guidance on how to adapt PRINCE2 to an agile business environment. The Practitioner exam is an objective style scenario based exam completed in the afternoon of day 3. The aim of the exam is to assess the participant’s understanding and ability to apply PRINCE2 Agile on a given scenario. The aim of this course is to provide a detailed understanding on how to adapt PRINCE2 to an agile development environment, by adopting the behaviours, concepts and techniques of the agile philosophy. Learn how to deliver maximum value within fixed constraints whilst still hitting project deadlines and keeping within budget. Existing PRINCE2 users will be able to easily tailor their current methodology to cater for today’s agile ways of working. PRINCE2 Foundation; PRINCE2 Practitioner; Project Management Professional® (PMP); Certified Associate in Project Management®(CAPM); IMPA Levels A, B, C or D® (Certified Projects Director). Should you wish to also complete your PRINCE2 training or not have one of the above pre-requisite certifications, you can mix our classroom and online training packages to achieve your PRINCE2 Agile Practitioner certification. Special discounted pricing is available for purchases of PRINCE2 classroom training with PRINCE2 Agile training (PRINCE2 Agile classroom or online). Our PRINCE2 Agile training comprises a mix of learning techniques including presentations, review and revision sessions, sample exam questions, class and case study exercises. Our training program is designed to facilitate an active and an enjoyable learning environment. You can complete your PRINCE2 Agile training through either instructor-led training or through purchasing our online PRINCE2 Agile e-learning package.